Even Scrooge would stop in his tracks with pre-event advertising that shines this bright! 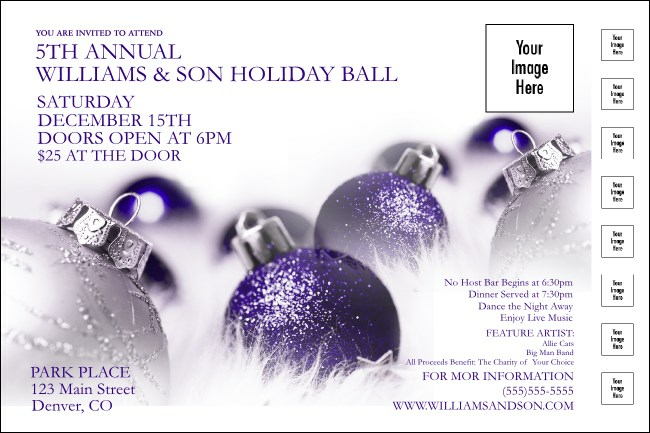 Christmas Ornament Purple Posters feature a beautiful purple-themed design with silver and purple glass ball ornaments covered in sparkling glitter. Upload nine unique images to the template for extra ad space and shine the light on sponsors or featured guests. Showcase the joy of the season with TicketPrinting.com.